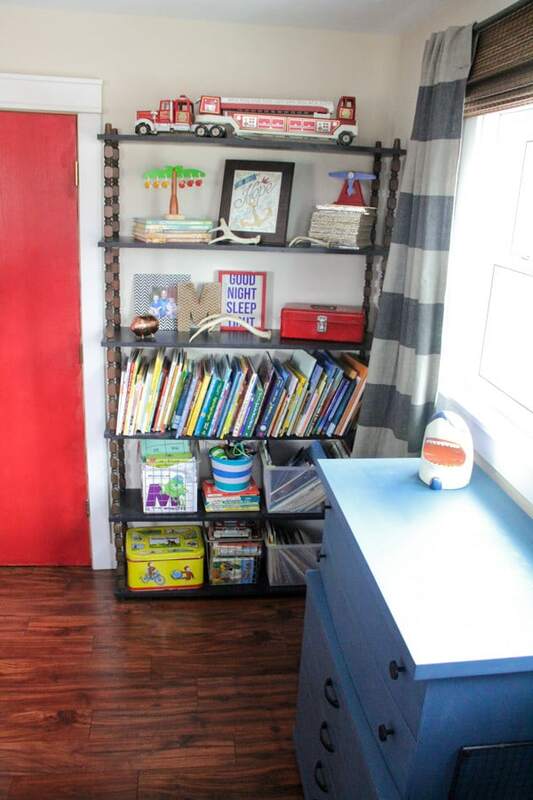 After a full week of kitchen reveals I have ONE more, but I decided it was time to take a break from the kitchen and move on to a room I’ve never shared on the blog: The Boy’s Room. It’s hard to name a style, but I think It would fall into the “vintage modern” category with the rest of the house. 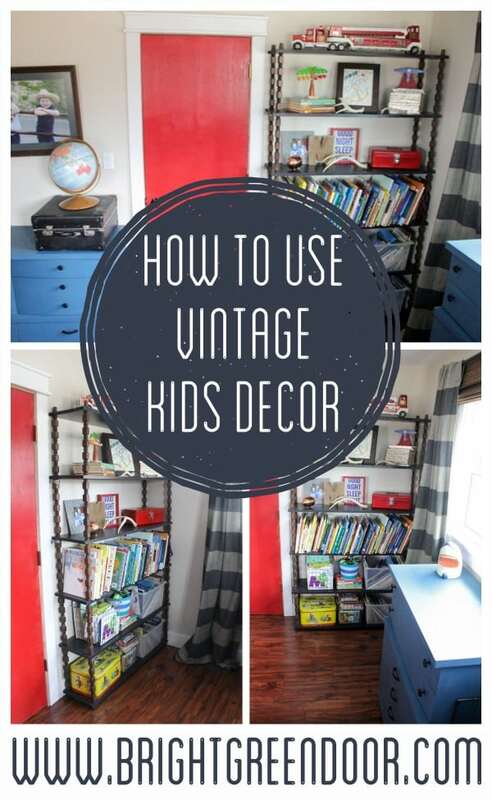 Often friends ask me how to incorporate vintage with new items, today I want to show you how to use vintage kids decor. Now this is the part where I’m a bad blogger who didn’t take pictures. Last year at an auction I won four old sets of vintage wood spindle shelving. 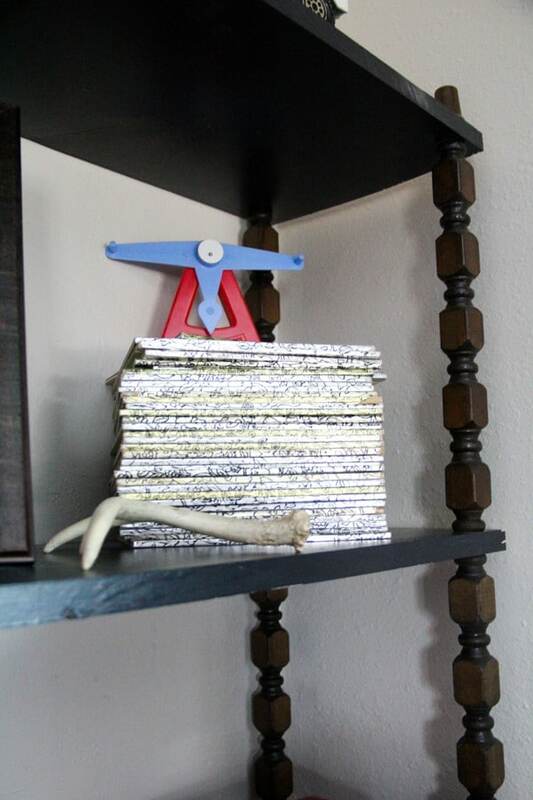 They had ugly MDF shelves, but I knew that I could re-purpose the spindles for something better. 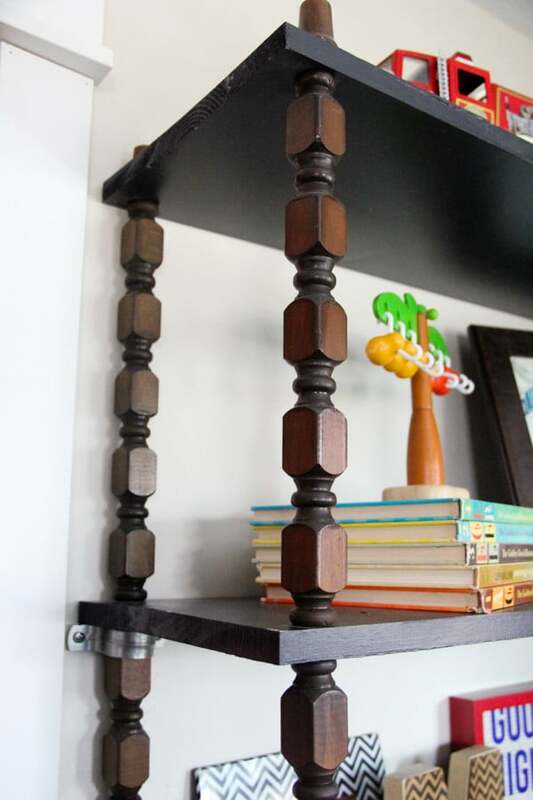 Fast-forward to this year and I had a desperate need for storage in the boy’s room, and a pile of these wood spindles. I measured this space and cut new pine boards to the perfect size, then painted them and drilled holes for the spindles. Then I just re-assembled it into a more modern version of it’s original self. 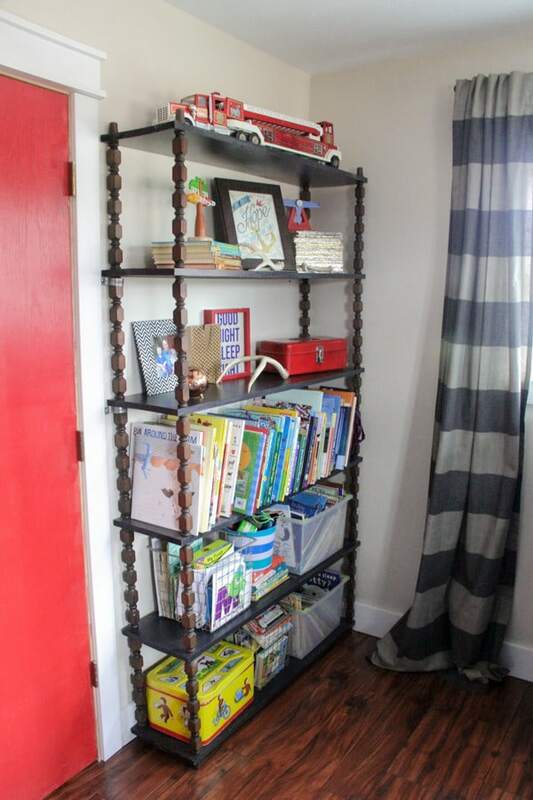 Often I fall in love with Kid’s rooms that I see in magazines and blogs, but I always ask, “Where is all their stuff?! 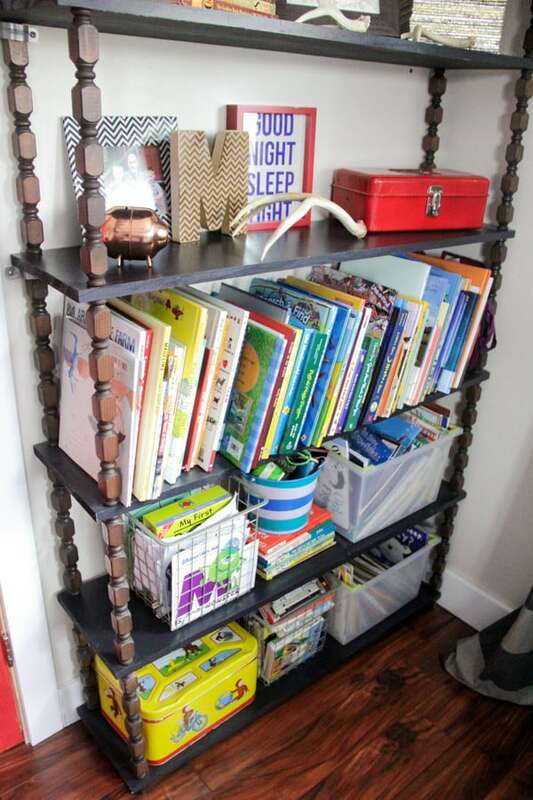 ?” As much as I’d like pretty styled shelves, this shelf is functional storage that we needed, and it needed to hold a LOT! Even though it needed to be functional, I also had to fill it with some of my vintage finds that I love. Like that yellow Curious George bread box on the bottom that holds the boy’s puzzles. And that vintage red tackle box that is filled with markers. 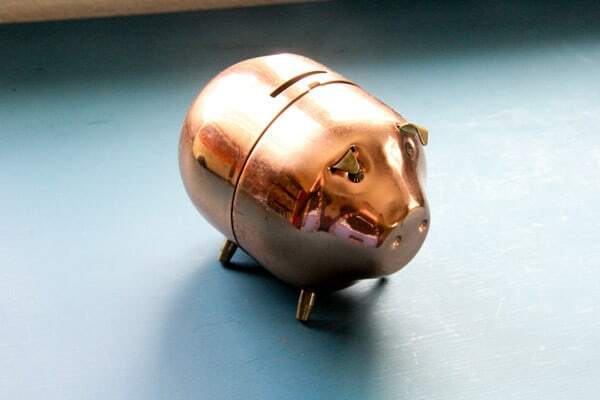 Or how about that amazing vintage pig piggy bank? Isn’t it the cutest rummage sale find ever?? The best part is that it cost a nickel!! My mother-in-law also saved ALL of my husband’s Little Golden Books and this is only SOME of them! These vintage kid’s dictionaries were another garage sale find. The Vintage Fire Engine was also one of my husband’s toys from when he was a kid. I love that the boys have some of the toys that were the most special to him! 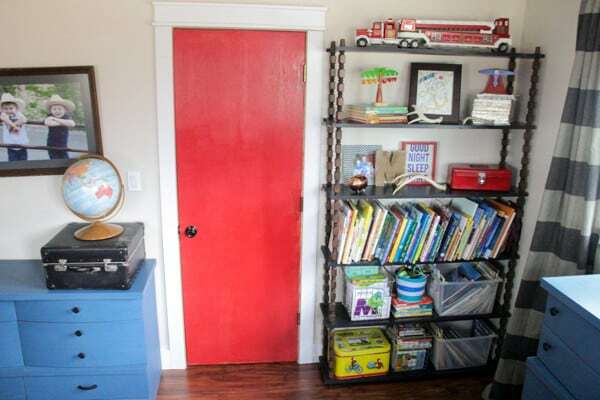 Since it’s really not deserving of it’s own post, I also wanted to point out how we painted their closet door red. 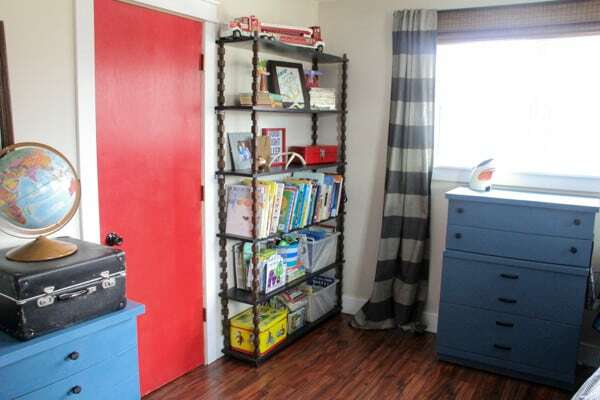 When we moved in it was just an unfinished door, so I just used a little jar of Rustoleum fire engine red on it. 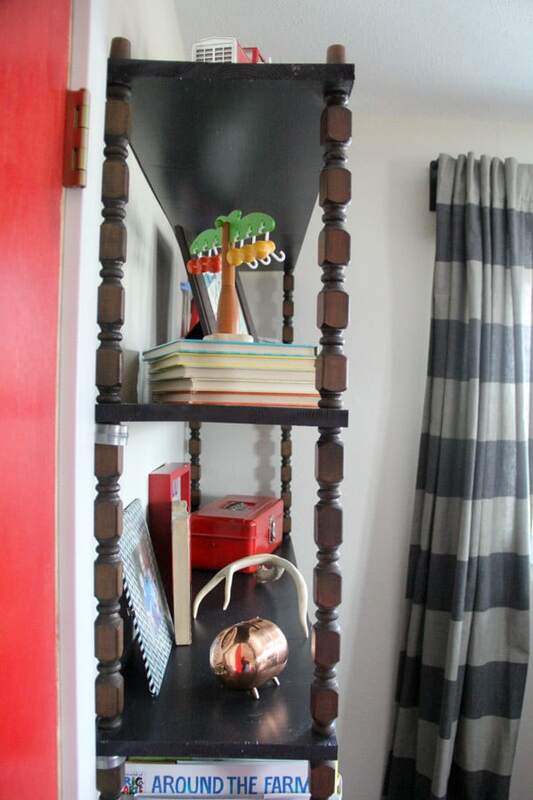 Next time you see an ugly old spindle shelf you’ll probably think twice before passing by huh?! 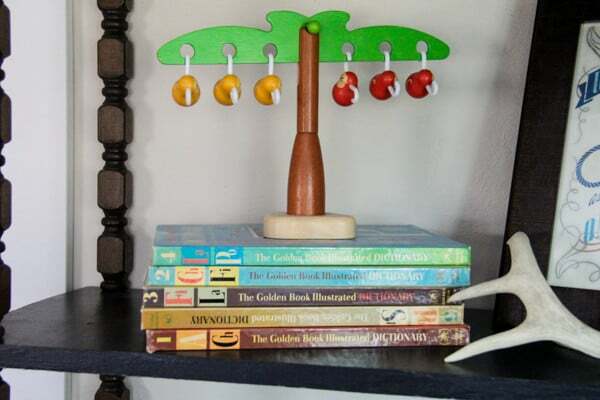 Do you have any of your family’s old toys that now qualify as “vintage”?! LOVE it – I’m all about vintage & adding the old with the new. Thanks! 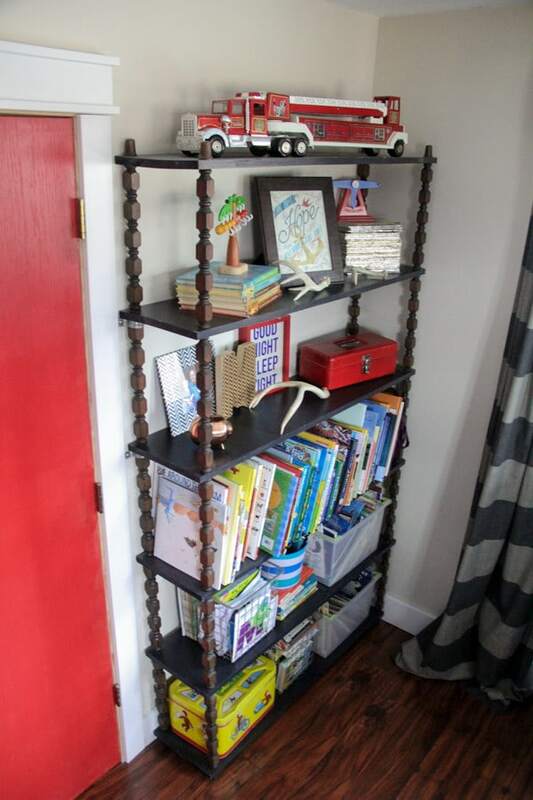 It definitely adds a lot more character and charm than a room full of new things… and the hunt is more fun too!